I am a mobile freelance hair and makeup artist with almost 15 years experience providing customized, timeless, and effortless hair and makeup. services. Based out of Sayulita, Nayarit, Mexico, I also work in Canada regularly and am lucky to split my time between the two countries. My career has seen me provide my style of personalized and attentive service to women for advertising campaigns, boudoir work, family & engagement sessions, but primarily for weddings, and I have prepared more than 800 brides and their parties on their big day. I have a complete obsession with providing the best quality service for my clients, bringing my 'A' game to every client, and creating a relaxed, fun and professional atmosphere while working . There are a lot of moving parts on a wedding day and always surprises, but there are no problems that can't be solved-I thrive on that stuff. I draw on my extensive experience with each and every one of my past and present clients to ensure the day goes of without a hitch and everyone feels like the queen they are! I consider it an honor to be chosen to be included in such monumental moments in my client's lives and am always thrilled to witness the excitement on a woman's face when her hair and makeup is completed, and she has no choice but to see herself objectively and without criticism-it's the most rewarding feeling to show women how others see their true beauty! I was recently selected as one of Canada's Finest Bridal Stylists by Weddingbells, as well as chosen as a member of the JoyWed 'it list' of select hair and makeup artists in my area. In addition to outstanding accolades from my clients and fellow vendors, I have also seen my work published in print and online. Print: Avenue Magazine (Edmonton), Blush Magazine, Bridal Fantasy Magazine, Perfect Wedding Magazine, and Weddingbells. Online: 100 Layer Cake, Bride.ca, Desiree Hartsock Lifestyle Blog, Elizabeth Anne Designs, JoyWed, Peter Loves Jane, Rocky Mountain Bride, Rustic Wedding Chic, Style Me Pretty (Canada & USA), The Luxe Pearl, Wedding Chicks, and yegwed. 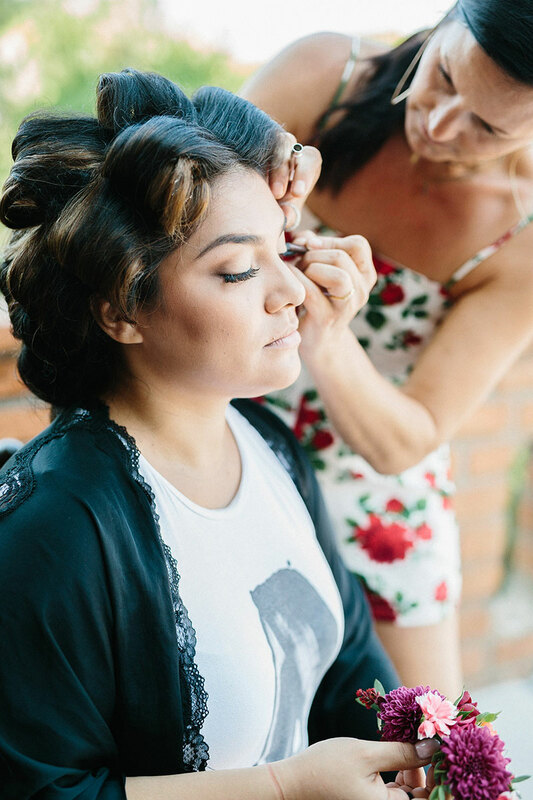 Justine is an amazing hair and makeup artist with 14 years experience in cutting, coloring, and most importantly, wedding styling in Canada and Mexico. Justine has worked on over 450 weddings and loves being with brides and their parties on their big day! Her relaxed vibe and positive energy, coupled with her genuine interest in other people are the perfect complement for my clients! I love her commitment to providing personalized and attentive service to each and every person she encounters in her chair. It's obvious why she and I work so well together! I first met Justine 15 years ago at the salon we both started our careers in. While the salon didn’t work out for either of us, it was a spring board for many amazing things to come, and the beginning of not only a special friendship, but an outstanding working relationship. She first started working with me on weddings in Canada more than 10 years ago(whoa! Time flies when you're having fun!). If you had asked either of us if we thought we would be where we are today with one another, we may have said no, but today, we can’t see it any other way!! 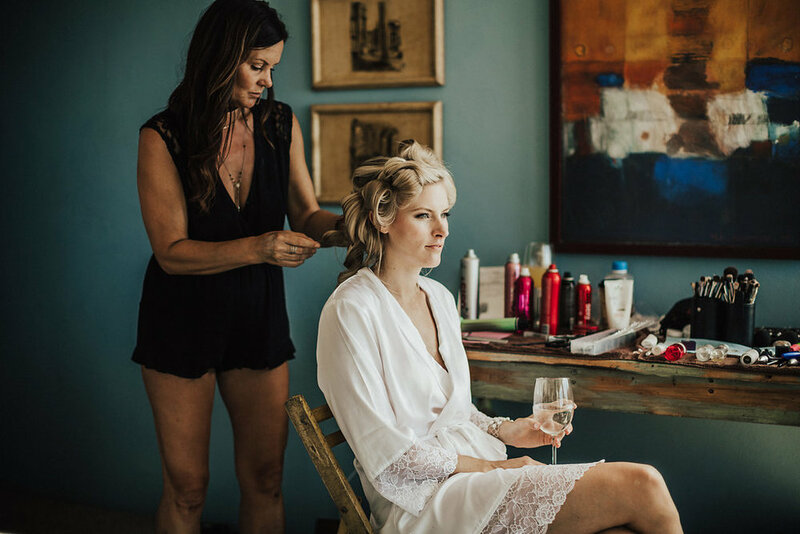 Justine has joined me in Sayulita to assist on weddings for the past 3 seasons, and when she isn’t in Sayulita working with me to glam up our amazing brides, she owns and operates a super cool salon in Edmonton, AB with her two awesome business partners. She continues to further her skill with training in Canada and the US whenever she has the chance. She is the mom to a sweet 15 year old son(we have mom club together haha…which really means wine club) has an infectious laugh, an open heart, LOVES food(who doesn’t?? ), and her interest in fashion and beauty keeps her on the cutting edge of what's on trend. Naturally, with a gal like that by my side in Canada, it’s a natural fit to have her work her magic in Mexico as well so I can rest easy knowing each and every client has the same attention I would expect for them if I were doing their services!! I'm a mom to an awesome son, I love to laugh, try to see the humor in most things(even the challenges), and appreciate the beauty in others. My goal is to be not just 'another vendor', but to be someone who ensures my clients have an experience they won't forget, and I absolutely LOVE what I do! There is something so fulfilling about having a client sit in my chair with their blank canvas, spending time getting to know them, hearing their story, and transforming their outer shell into the beauty I see come from the inside. When I was a kid, I loved playing with people's hair. When we had guests over, I would ask if I could brush their hair and style it. Fast forward 20 years, and I found myself with the opportunity to make a career out of playing with people's hair and making them look their best for their most monumental events. Never for a moment did I think my love of brushing hair when I was a kid would become my passion, and I would make a career out of it in two countries. Yet here I am, and I wouldn't change a thing! In 2003, I started working in a busy salon in Edmonton, AB and attained my Red Seal Hairstylists license, while training in makeup techniques to ensure bridal clients and their parties received the best experience while getting ready for their big day. I was involved in other aspects of hair and makeup as well, such as photo shoots, competitions, and fashion shows. I was hooked! After 4 years of working in the salon, it was time to move on, and freelancing was a natural fit for myself and my busy family. Since that time, I have been entrusted with the preparation of more than 800 brides (wow!) and their parties on their wedding day and in the months leading up to it. Beside doing bridal work, I also provide services for clients in Canada and Mexico for boudoir, family, and engagement photo shoots, and commercial and fashion shoots, as well as personal events. I have chosen not to specialize in one area, as I feel that being involved in all areas provides my clients with the benefit of more experience and it keeps my creative juices flowing. Since expanding my services to include locations in Mexico, I feel so priviledged to be included in the special days of brides from all over the world. I'm thankful for the wonderful people I work with and am humbled to be invited to many of the most monumental moments in their lives.